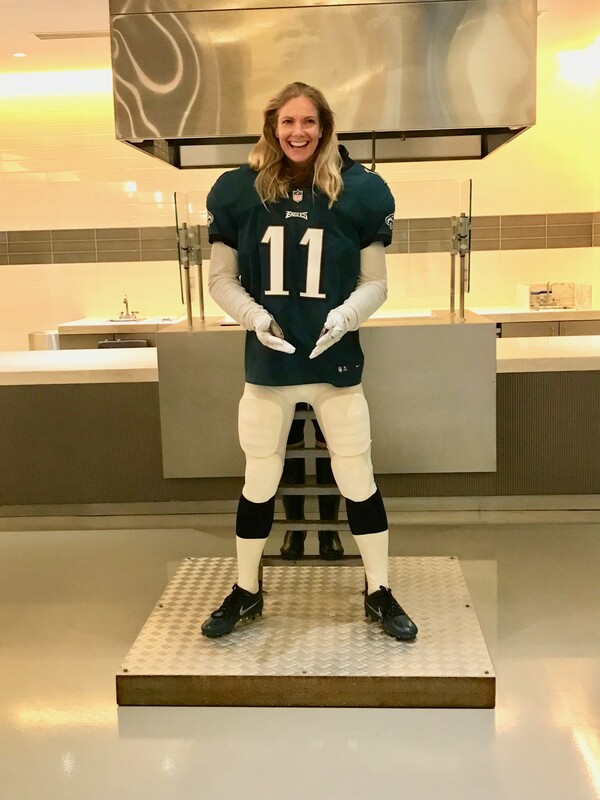 On Sunday, February, 25 we kicked off Reach & Raise in the Eagles locker room. 150 of us enjoyed the adventure. To register for Reach & Raise 2018, May 20th on the Philadelphia Art Museum Steps, click here and register with Living Beyond Breast Cancer. Below is the poem and reflections shared during the class. Take a moment to pause: Lay on the ground or find a comfy chair. Take a few conscious breaths. Do that now. Please do it. You’ll feel better. 1. Beauty is you trusting yourself, your gut feelings. You know your beauty is inside you. You have beauty. You don’t have to go find it. Your beauty is your brilliance, your consciousness, your inklings of ideas, seeds you have planted. You have greatness in you. Rest there. Beauty move from inside. 2. Beauty is your sacred quest. You are sacred, one of a kind. The quest opens inward. Know yourself intimately. Embrace your inner beauty. Dare to love your self or do what’s necessary to love yourself. 3. Beauty is knowing there are no accidents, that everything and everyone is a teacher. Appreciate with awe, how things are unfolding. Appreciate through your eyes, ears, nose, mouth, all your senses what you are learning. Release judgment. Grieve when needed. Learn what beauty there is to learn today. 4. Beauty is the appreciation of your fullest self. Your fullness your challenges, struggles, depression, joy and successes. Bring all of your self under the light of your appreciation. Appreciate where you are today and praise yourself. You are beautiful.